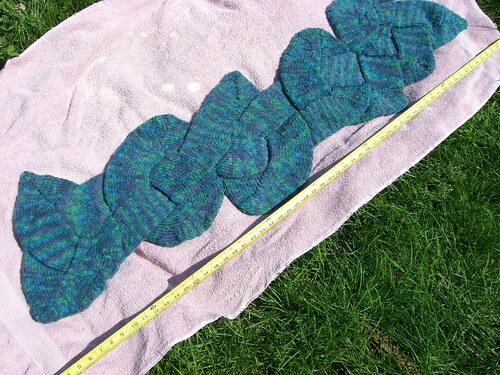 This very wide, very warm scarf is knit as two long stockinette tubes which loop around and under and over one another. Short rows and wrap-and-turn accomplish the various corners. This particular cable is copied from the beautiful collarbone tattoos of the talented web spinner at Damask Blue Designs. The pattern is very much in “beta test” mode, and I’m pleased to offer it for free until it has been thoroughly test-knitted.